Now, this doesn't mean it doesn't exist, I just haven't succeeded yet. But, you know what totally makes up for any sort of problems with baked french fries flavor? Smothering them in homemade gravy and lots of cheese. I've never been particularly in love with gravy, but I've started coming around to it in the past year. I'll never be anywhere near my brother's level of obsession (he used to order gravy anytime he'd get chicken fingers when we were out, or sometimes he'd just like...drink gravy, lol! ), but I'll eat it on occasion-such as on these fries! And the cheese really adds a great sharpness and extra bit of gooeyness. I warn you, this is a totally dangerous and addictive recipe. I couldn't stop eating these. Poor Michael ended up with only...like...a third of the recipe instead of half-I couldn't control myself from going after his bowl! 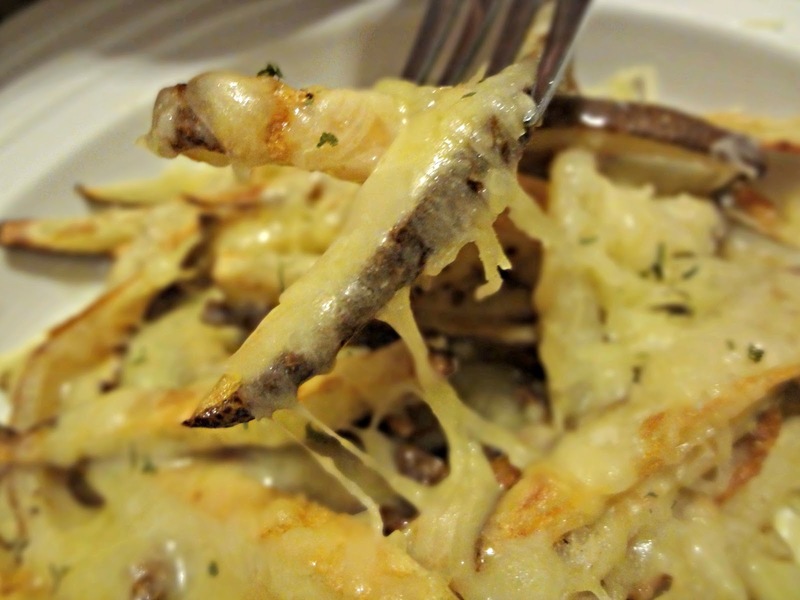 Rich, flavorful, warm, comforting-all good things in these fabulous fabulous fries. 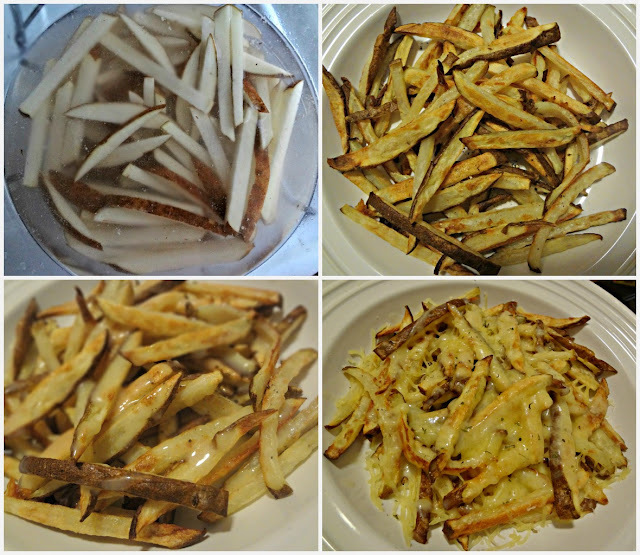 I'd never had "poutine" fries before this recipe but now I am totally in love with the concept-so all you Canadians/Frenchies should come make me some authentic ones sometime, k? In the mean time I'll just content myself with these. Preheat oven to 450 degrees. Spray a large baking sheet with non-stick spray. Scrub potatoes and cut into 1/2 in. planks. Submerge potatoes in a bowl of cold water for 15-20 minutes. Drain the potatoes and thoroughly pat dry with towel(s). 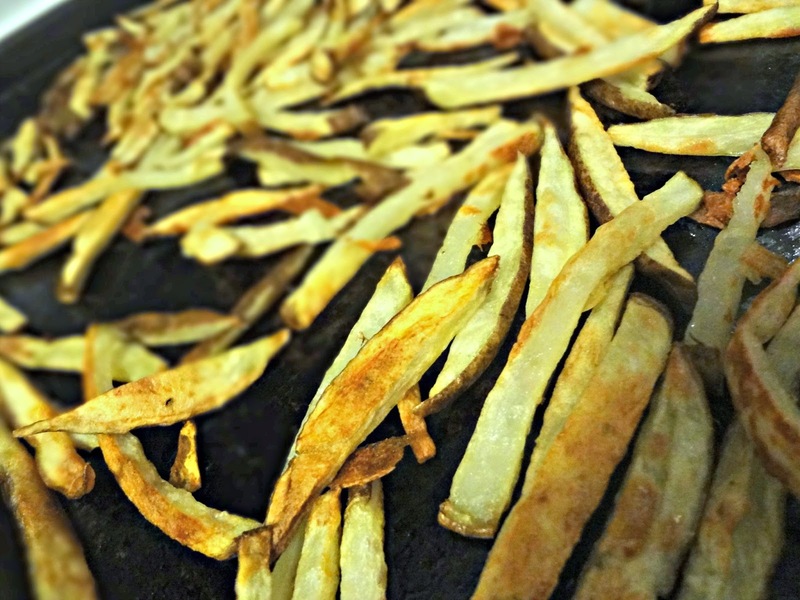 Clean and dry bowl, then return the fries and toss with a little oil and any desired seasonings. Lay evenly in a single layer on baking sheet. Bake 20-30 minutes, turning occasionally, until browned and crisp. Meanwhile, melt butter/grease in a saucepan on medium-high heat and then whisk in the flour. Continue whisking about 2 minutes. Slowly, still whisking, pour in the broth. Cook 3-5 minutes, or until thick (if it doesn't thicken up after awhile, whisk in more flour). 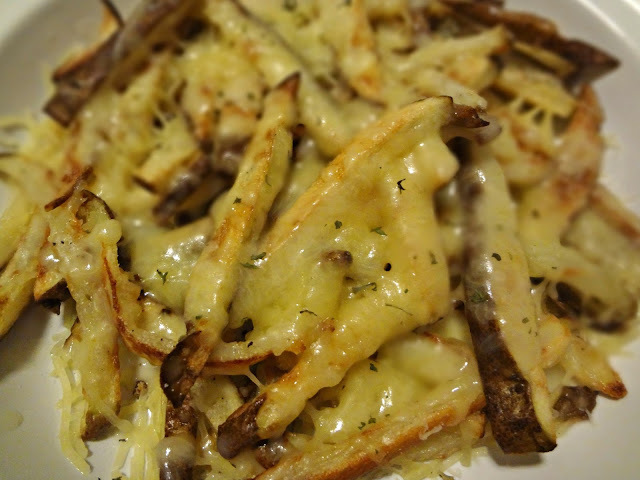 Pour gravy over baked fries and then sprinkle with cheese. The heat will melt it, but you can also pop it under the broiler to get thoroughly melted and bubbly.